Orthodox Societies: Will religious violence tear Egypt apart? Will religious violence tear Egypt apart? Sectarian violence between Egyptian Muslims and Christians intensified over the weekend, triggering an emergency meeting of government ministers. The new government threatened to use an "iron fist" to stop the clashes between the Muslim majority and Coptic Christian minority, which have been on the rise since former President Hosni Mubarak's regime fell three months ago. Twelve people were killed Saturday in fighting outside a Cairo church, where Muslims believed a Christian woman was being held against her will because she wanted to convert to Islam. Will religious differences dash hopes of peaceful democracy in Egypt? Yes, sectarian tensions could destroy the revolution: "Copts felt secure under Mubarak, who tightened his grip over Islamists," says Amro Hassan in the Los Angeles Times. 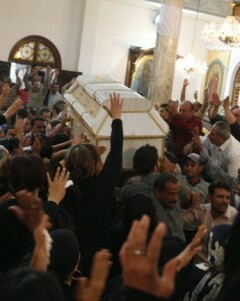 Now radical Salafi Muslims are on a rampage, and they have burned down two Coptic churches since Mubarak fell. The interim military-led government has been preoccupied with economic and political problems, and now the unchecked religious feud is spinning out of control. "Egypt: Religious conflict becomes the revolution’s biggest enemy"
The Copts' future is in their own hands: Coptic Christians "understandably feel threatened by the surge of Islamism in Egypt," says Amira Nowaira in The Guardian. They survived under Mubarak by staying on the sidelines, but they can't afford to do that now that he's gone. They need to join political parties and get involved in the new political world — as citizens, not Christians — because "their active participation, along with secularists, liberals and women, will be the most powerful safeguard against any deviation or extremism." "The role Copts should play in post-Mubarak Egypt"
Beware an emboldened military: The fear of a takeover by radical Muslims has probably been exaggerated, says Mark LeVine at Al Jazeera. The Muslim Brotherhood, which has clout at the ballot box, is considerably more moderate than the ultraconservative Salafist sect that has been attacking Coptic Christians. But the chaos "could easily derail the messy process of political change" set in motion by the pro-democracy protests, because it's "giving the army an excuse to crack down hard on all forms of dissent and protest."